"The slightly odd thing about the one (yesterday morning) is that it is not in the same area as last month's quake," Fryer said. "Strictly speaking, this one was not an aftershock. It's a completely new earthquake." Both the Oct. 15 6.7-magnitude quake and the 5.0-magnitude quake on Thanksgiving occurred northeast of the Big Island, off the Kohala coastline. Last month's quake resulted in millions of dollars in damage and crippled the islands' power system for several hours. 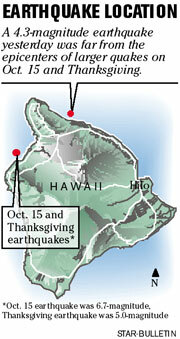 Both the Oct. 15 and the Thanksgiving events were deep quakes, which meant they were easily felt across the state. Yesterday's quake was not as deep as those. Fryer said all this moving and grooving means the layer of earth the Big Island sits on, called a lithosphere, has been sagging underneath the weight of the island. "The whole thing is in tension," Fryer said. "Occasionally you have a little crack, and these earthquakes are the little cracks." All of the earthquakes' depths and motions have been consistent with the sagging, which has been occurring over the last half-million years, Fryer said. Looking under the waterline of the western coast, Fryer said, there is a step formation that is indicative that more of the island once was above water. "The whole thing has slowly been sinking," Fryer said. "Nowhere else is the lithosphere burdened so heavily by such a heavy load."